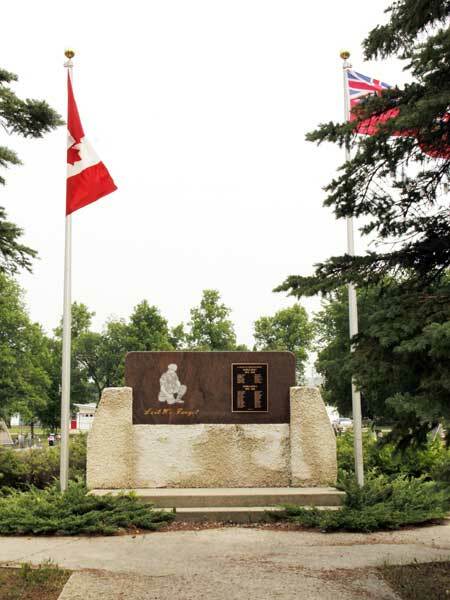 The Niverville Remembrance Memorial in the Town of Niverville was constructed in 1997 in memory of veterans who served in the First World War and Second World War. The soldier on the memorial was designed by local resident Pat Penner. Others who served included Alfred Blair, Max Bronstone, Robert L. Clarke, James French, Cecil Harrison, Guy Harrison, Edward Harrison, John Muir, William Stanning, David Stott, Henry Strange, and Harold L. Taylor. Others who served included William D. Beaton, Joesph Belanger, Irene E. Church, John Church, Lynn Condon, David Doerksen, Delmar Eby, Ernest Fehler, Henry Fehler, Robert Forest, Eugene Gauthier, Ulderic Grant, David Hiebert, John Hiebert, Daniel Hildebrand, Joe Kreibich, Bill Kuzenko, Edward T. Leppky, Frank Neufeld, Gordon Otley, Peter Sofroniuk, David Stott, Jack Stott, Donald Wallace, John Wallace, Henry Ward, Allan A. Wiebe, and Stuart Wittick. This page was prepared by Jean McManus, Tighe McManus, Gordon Goldsborough, Darryl Toews, and Tim Worth.